Due to an outbreak of Whirling Disease last year, the California Department of Fish and Wildlife (CDFW) will be canceling the popular “Kids’ Fishing Days” at the Mt. Shasta Hatchery indefinitely. The hatchery typically hosted several such events each summer. A separate “Kids’ Fishing Day” is still scheduled for Saturday, May 14 at Grace Lake in Shingletown. Similar events were held in March and April in Redding and Bend. Whirling disease is caused by Myxobolus cerebralis, a protozoan parasite that destroys cartilage in the vertebral column of trout and salmon. It is fatal or disfiguring to infected trout and salmon but does not affect humans. Fish infected with whirling disease are safe for human consumption. Whirling disease was found in three CDFW hatcheries in 2015 and has been contained with hatchery operations resuming in all three. CDFW pathologists routinely inspect each of the 13 state-run trout hatcheries which raise approximately 10 million trout for California anglers statewide, as well as the nine hatcheries that raise over 31 million young salmon and steelhead. The Crystal Lake Hatchery in eastern Shasta County reopened to the public Thursday after being closed due to a major environmental restoration in nearby Rock Creek. Beginning in October 2015, construction work prompted the closure of the viewing area at the hatchery and the temporary cancellation of tours to ensure the safety of both the public and the workers. The hatchery continued to raise and plant trout during the construction. Although the construction project is ongoing, the facility is now free of any equipment and personnel that would prohibit the public from safely visiting. The Rock Creek restoration project consists of re-routing the hatchery supply pipeline and moving a diversion dam on Upper Rock Creek to a new location downstream. The project will create habitat for the endangered Shasta crayfish while maintaining a continuous, clean water supply to the hatchery. 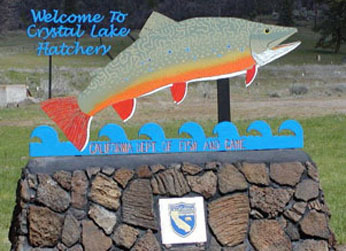 Crystal Lake Hatchery spawns, raises and releases catchable rainbow trout, brook trout and brown trout every year for planting in northern California lakes. It is one of 23 state-run hatcheries that provide millions of fish for California anglers. Visitors may call the hatchery at (530) 335-4111 for more information. A complete listing of state hatcheries is available at www.wildlife.ca.gov/fishing/hatcheries. The salmon ladder at Nimbus Hatchery in Rancho Cordova will open Monday, Nov. 2, signaling the start of the spawning season on the American River. California Department of Fish and Wildlife (CDFW) hatchery workers will open the gates in the ladder at 9:30 a.m. and may take more than a half-million eggs during the first week alone in an effort to ensure the successful spawning of the returning fall-run Chinook salmon. California is entering what may be a fifth year of unprecedented drought. Because of current river conditions, salmon are returning later in the year than typical. Overall, the fall-run Chinook salmon return numbers are lower than normal. CDFW seeks to match historic hatchery production goals this year, but that may not be possible given the conditions. The three major state-run hatcheries in the Central Valley – the Nimbus Hatchery in Sacramento County, and hatcheries on the Feather River in Butte County and the Mokelumne River in San Joaquin County – will take approximately 24 million eggs over the next two months in order to produce Chinook salmon for release next spring. Each hatchery has a viewing area where visitors can watch the spawning process. Thousands of schoolchildren tour the Nimbus and Feather River hatcheries each year. The visitors’ center at Nimbus Hatchery includes a playground with replicas of giant salmon that are enjoyed by young and old alike. For more information about spawning schedules and educational opportunities at each hatchery, please visit the CDFW website at www.wildlife.ca.gov/fishing/hatcheries. There are eight state-run salmon and steelhead hatcheries, all of which will participate in the salmon spawning effort. Those hatcheries, along with federally run hatcheries, will be responsible for the release of approximately 40 million juvenile salmon into California waters. These massive spawning efforts were put in place over the last 50 years to offset fish losses caused by dams that block salmon from historic spawning habitat. Once the young salmon reach 2 to 4 inches in length, one-quarter of the stock will be marked and implanted with coded wire tags prior to release. CDFW biologists use the information from the tags to chart the salmon’s survival, catch and return rates. Darrah Springs Hatchery, operated by the California Department of Fish and Wildlife (CDFW), was partially released from quarantine on Oct. 9 after being in quarantine since May because of whirling disease. Extensive DNA testing of the fish by a commercial sciences lab have determined that all the trout in the hatchery building and the lower rearing ponds are free of the disease and the hatchery is resuming normal operations for that portion of the facility. The upper part of the hatchery, located near the town of Paynes Creek, is still infected with the disease; the fish there will be destroyed, recycled and used for pet food and other purposes. The fish rearing areas still infected will be dried up and not utilized until the water supply can be either disinfected through a water treatment system or pathology testing verifies that the water supply no longer is infected. Approximately 160,000 fish will be euthanized. The disposal of infected hatchery-raised trout is a necessary precaution to prevent the spread of disease to non-infected state waters where the fish would normally be planted. Whirling disease is caused by Myxobolus cerebralis, a protozoan parasite that destroys cartilage in the vertebral column of trout and salmon. It can be fatal to infected trout and salmon but does not affect humans or other wildlife or fish. The whirling disease parasite is naturally present in some streams and rivers in California. Hatchery outbreaks are unusual but not unheard of (there has never been another outbreak of whirling disease in the department’s hatcheries in northern California). Darrah Springs Hatchery supplies catchable trout for waters in Lassen, Modoc, Shasta, Siskiyou and Trinity counties and is one of 21 state-run hatcheries that provide millions of fish for California anglers. The Crystal Lake Hatchery in eastern Shasta County is currently closed to the public while a major environmental restoration is underway in nearby Rock Creek. Crystal Lake Hatchery spawns, raises and releases catchable rainbow trout every year for planting in northern California lakes. It is one of 23 state-run hatcheries that provide millions of fish for California anglers. The Rock Creek restoration project consists of re-routing the hatchery supply pipeline and moving a diversion dam on Upper Rock Creek to a new location downstream. The project will create habitat for the endangered Shasta crayfish while maintaining a continuous, clean water supply to the hatchery via a water recirculation system. The hatchery is scheduled to be closed to visitors for most of October and November. Visitors may call the hatchery at (530) 335-4111 for more information and updates. A map of the work location and affected waterways can be found here. A complete listing of state hatcheries can be found at www.wildlife.ca.gov/fishing/hatcheries.